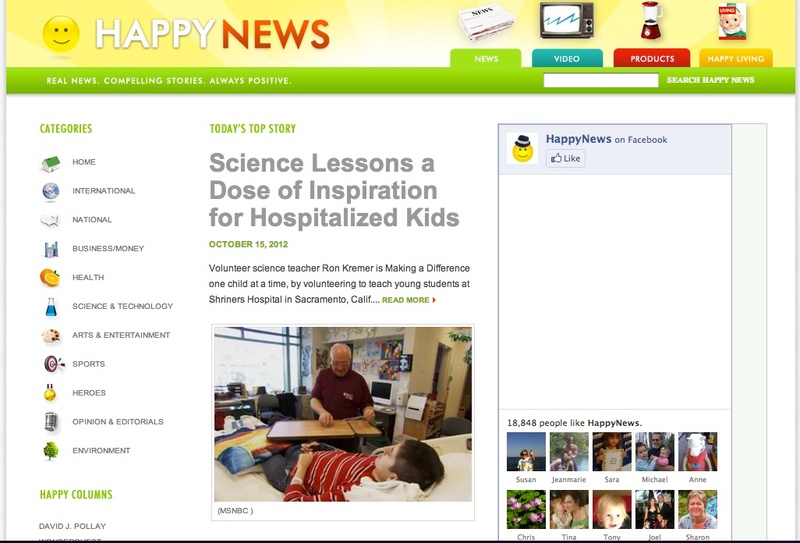 Happy News is a news media site that focuses entirely on positive news stories, avoiding negative gossip, stories of violence or other negative news stories. Mission “Real news. Compelling stories. Always positive.” The articles on the site are not written by people who run the site, they are found on other major new sites. The story formats include text and videos that are gathered from other sites. The design is very basic with bright cheerful colors. There is a category column on the left, as well as tabs for navigation across the top and a search box. The site’s goals appear to be sharing positive news stories as well as resources including product reviews and links. It does not appear that there is any specific sponsorship of the site, but there are ads on the sides of some of the pages. Business wise revenue appears to be generated by sold ad space. Facebook is the right hand column of the homepage, with the like option. There are links on each story to allow you to share the story on social media sites for Digg, Delicious, Facebook and Reddit, but no obvious RSS. While there has been a number of pieces on the overall value of the site itself. Mostly the discussion about the site had nothing to do with it’s design but the usefulness of an all positive news site.